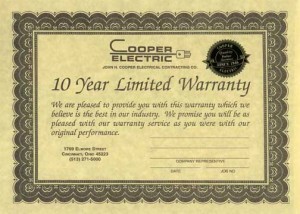 Cooper Electric is pleased to offer a 10 year warranty on labor. Material is warranted by the manufacturer and we pass any material warranties through to our customers. For example , Cutler-Hammer circuit breaker panels are warranted for 15 years from the date of installation and the circuit breakers in the panel are warranted by Cutler-Hammer for the lifetime of the panel in which they are installed. Expect only the best from your Cincinnati Electrician Cooper Electric? Acts of God, abuse, neglect or any damage covered by homeowner insurance. For ten years from the date of installation. Replace or repair the covered defective materials and workmanship. (513) 271-5000 for warranty service. 1) This Warranty is transferable to subsequent owners. 2) We will not pay for incidental or consequential damages such as loss of refrigerated or frozen foods or additional living expenses. Some states do not allow the exclusion or limitation of incidental or consequential damages. therefore this exclusion may not apply to you. 3) This warranty may be voided if someone other than Cooper Electric performs service on the work covered by this warranty.